Philadelphia is one of America’s most treasured and historical cities. Besides the fact that Philadelphia is considered the birthplace of the United States, it is also where the first newspaper in America was established. The first zoo in the United States was also established in Philadelphia not to mention that the city is also home to the country’s first hospital. Located at the intersection of the Schuylkill and Delaware rivers in Pennsylvania’s southeastern side it is the largest city in the state and the fifth largest in the entire country. A lot of visitors, around three million visitors in fact, are attracted to Philadelphia each year. This is most likely due to the rich concentration of historic sites found in this great American city. Traveling with kids is always difficult, especially if you are waiting between flights or just generally. The Philadelphia International Airport provides a kid’s corner to make traveling with kids easier. the kid’s corner is way beyond just fun kid games and activities; providing educational tools and lists of books on aviation to keep the curious minds of the children engaged. The airport also provides the SEPTA bus so that passengers; locals and tourists alike can visit the nearest attractions without much hassle. Philadelphia has a lot of places that are interesting and entertaining. There is much more to visit beyond just the cobblestone streets and historical sites. The PHL Airport is surrounded by many options of fun and entertainment where you can explore the centuries of history and architecture plus the beautiful neighbourhoods that make up Philly. Places like museums and performing arts theatres bring the city alive and you can conveniently reach these places from the PHL Airport. If you are planning to land in Philly to kick off an amazing vacation, then the PHL Airport is a good option to have a quick and easy access to several fun sites. The Philadelphia International Airport with the code PHL is regarded as one of the most important airports in the city of Philadelphia. The airport is complete with modern facilities including accessibility features for travelers dealing with disabilities. Services like skycaps, sighted guides and wheelchairs are provided to make every passenger regardless of their physical abilities to feel welcomed at the airport and travel without anxiety and frustration. As the largest city of the state, Philadelphia is home to the world-famous cheesesteak as well as the iconic Liberty Bell. The Philadelphia International Airport is a major facility in the state of Pennsylvania, garnering some of the largest crowds on the east coast. To make sure you get to your ride on time, reserve a shared ride van by booking with us, getting to your destination with comfort and plenty of room. The historic Liberty Bell usually has a huge line of people standing in front of it, making it even more important to start your day early. Spend the day sightseeing and have everyone in your party join by booking a private van for your adventures. Contact us for details on pricing and models, heading out to other great locations like Independence Hall, the famous location of the signing of the Declaration of Independence as well as the United States Constitution. In order to get intimate moments out of your trip, you’ll need an intimate ride – book a private sedan and head out to the Philadelphia’s famous Museum of Art, an iconic piece of local culture that features amazing artifacts from some of the most well known films. Afterward, stop by Barbuzzo for savory Mediterranean food in an elegant, but simple environment that’s perfect for unwinding. Philadelphia is the perfect place for a vacation, but even more so if you’ve got a family. Show up to the kid-friendly Franklin Institute, an interactive science museum with awe-inspiring exhibits – you can get to the unending fun by reserving a comfortable and spacious private SUV from two of Philadelphia’s finest ride services. If you’d like to visit a landmark that appeals to everybody and not just the children, visit Franklin Square, a beautiful park that has its own playground and an antique carousel. Dive into Philadelphia’s luxury community in a stylish ride by checking out one of area transportation providers for stretched limousines for a ride as comfortable as it is elegant. Have your chauffeur take you to Vetri, a fanciful Italian restaurant with an upscale menu and a prime downtown location. When you’re done trying Vetri’s extensive wine menu, take a ride to Le Meridien Philadelphia for a 4-star drinks in an amazing historic location. If you’re a larger-than-life family that loves to go everywhere together, you’ve probably already run into issues of mass transportation. Fix this issue by booking a chartered bus, a local bus service that allows tourists to get around without getting separated. There are almost too many museums to choose from downtown, making it a great place getting lost in a sea of learning. Spend the day at world-class art exhibits, like the ones in Barnes Foundation or Drexel University’s Academy of Natural Science. 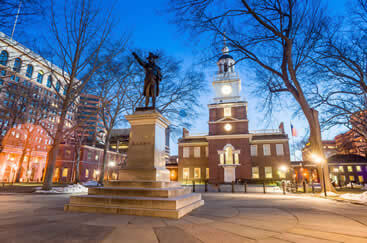 Philadelphia is one of the major cities of the United States due to its central location, size, population as well as the cultural and recreational resources harbored by it. The terrain of Philadelphia is relatively flat, making it a great place for exploration trips. Among US cities, Philadelphia is considered to be among one of the safest large metropolitan destinations to travel to so get started planning your trip here today. → Visiting all of Philadelphia’s exciting destinations is easy as there are a number of bus tours that can treat a tourist to a sightseeing trip of the historic sights. → The city also offers boat tours that offer travelers a magnificent view of the city’s skyline. → For travelers who have a thing for shopping, Philadelphia can definitely accommodate you. Not only does the city have traditional retail outlets, it is also home to numerous outlet shopping and spectacular traditional shopping malls. The independence hall is situated in Chestnut city’s Southern side in between the 5th and the 6th street. The hall is open for visiting all year round and the opening and closing time vary depending on the season. For one to be admitted into Independence Hall, tickets are required. One can acquire a free walk-up ticket at the Independence Visitor Center or you can also avoid the hassle of waiting in line for a walk-up ticket by purchasing a timed ticket. → Independence Hall is regarded as the birthplace of the United States Constitution and the Declaration of Independence of the United States of America. 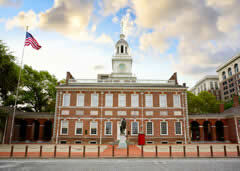 → All Independence Hall patrons are treated to a guided tour of the Hall by National Park rangers. The tour often begins from the courtroom but can change seasonally. 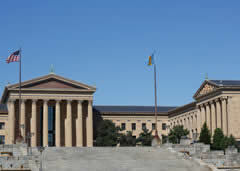 The Philadelphia Museum of Art is one of the United States’ largest museums. There are diverse collections found in the main building of the museum, which is found in the northwestern end of the Benjamin Franklin Parkway of Philadelphia. The items that are housed in the museum include works from Europe, America and even Asia. The museum offers a lot in terms of its collections which makes it an awesome place to visit on your trip. → The museum has got a rich and extensive collection of items, totaling close to a quarter of a million objects in all. → There are about 25 special exhibitions put on annually by the museum. These exhibitions draw visitors from all over the the world.